Performing plastic surgery operations using the latest scientific surgical techniques at state-accredited surgical facilities and comprehensive post-operative care, we Dr. Spies and his staff strive to provide a positive experience in every way. This includes providing friendly and personal attention during your initial visit. Dr. Spies, is highly qualified to perform both cosmetic and reconstructive surgery with over 24 years of experience in the greater Phoenix area. The Mommy Makeover is a combination of cosmetic surgical procedures designed to restore youthful breast and body contour to a mother’s new body. Such procedures include the tummy tuck, breast augmentation, breast lift, or liposuction – all of which are performed by board-certified plastic surgeon Dr. Robert J. Spies at his practice in Paradise Valley, Arizona. Dr. Spies uses the latest techniques and state of the art equipment when performing surgical procedures, including facelifts. This form of plastic surgery can help soften the appearance of aging by removing excess facial skin and tightening the underlying muscles and tissues. Patients interested in a breast augmentation evaluation and receiving a customized surgery plan are encouraged to schedule a consultation with Dr. Spies. During a consultation with Dr. Spies, he will educate you on all the aspects of the breast augmentation surgery. Dr. Robert J. 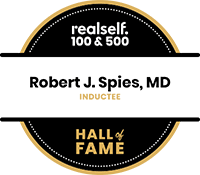 Spies is highly qualified to perform both cosmetic and reconstructive surgery with over 24 years of experience in the greater Phoenix area. Phoenix Magazine, which yearly features the Valley’s best physicians voted by peers, has recognized Dr. Spies as a ‘Top Doc’ in Arizona Plastic Surgery. He believes performing plastic surgery procedures that combine art with modern science will positively improve a person’s self-image and self-esteem.